Birds are assholes with good PR. Some of them eat fluffy things we like, others poop everywhere, and most of them are loud. And yet we buy insurance from them, we name sports teams after them, and we even allow big ones to teach our children their ABCs. It took Alfred Hitchcock to tell the truth about the little bastards. The Birds is the closest Hitchcock ever got to science fiction, and it was his last movie to receive near-universal acclaim. Although loosely based on Daphne Du Maurier's novella of the same name, the screenplay (by crime novelist Evan Hunter) was also inspired by a real life incident in which seabirds suffering from amnesiac shellfish poisoning slammed into buildings in a small California town. Following the surprise hit of Psycho, this was Hitchcock's return to big-budget moviemaking. For the lead roles, the director originally sought out his frequent stars Grace Kelly and Cary Grant. When they turned him down he went to Tippi Hedren and Rod Taylor. 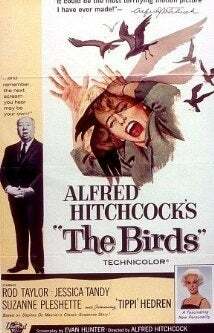 (Unfortunately for Hedren, Hitchcock also transferred his creepy obession with blondes to her) Hitchcock made a surprising move to use no musical score so that it wouldn't distract from the bird sounds, which were created with an early synthesizer. As with Psycho, The Birds begins with a woman driving from the big city to the country. But while Marion Crane is escaping her boss, Melanie Daniels (Hedren) is in pursuit of romance. Having been embarrassed by a prank played on her by Mitch Brenner (Taylor) at a San Francisco pet store, Melanie is both furious and intrigued. The socialite tracks Mitch to his home in the fishing village of Bodega Bay, and so far we're in a romantic comedy. Melanie draws suspicion from Mitch's mother Lydia (Jessica Tandy) but endears herself to his younger sister Cathy (Veronica Cartwright). And yet in the background, the birds are starting to act strangely. The Birds is probably Hitchcock's most effects-laden film, and the bird attacks are still pretty spectacular (or at least better than this: http://www.imdb.com/title/tt131603…). Hitchcock lets the bird attacks come so naturally that the characters ignore them at first. A stray gull hitting Melanie while on a boat ride leads to sparrows entering the Brenner house, a children's birthday party gone awry, and then the famous playground scene. The playground scene, like the shower scene in Psycho, has been referenced and parodied so many times that its impact may seem muted. But the cuts from Hedren to the jungle gym are so well-paced that it's hard not to be drawn in when you see it. Yet the most terrifying scenes are to come. The birds attack a man at a filling station, causing a massive explosion and fire. The climax, back at the Brenner house, is one of the scariest Hitchcock ever filmed. The siege bears a striking resemblance to the standard zombie attack as pioneered by George Romero in Night Of The Living Dead. (Another scene, involving the discovery of a corpse, also resembles the Romero film). Oddly enough, the leads are probably the least interesting characters in the movie. Hedren and Taylor are both good-looking, but they are out-acted by Tandy and Suzanne Pleschette as Annie, Mitch's former lover. Also notable is Cartwright, whose nervous energy was also used to great effect in the 1978 version of Invasion Of The Body Snatchers and Alien. One of the most frightening aspects of The Birds is that, of course, we have no idea why they attack. Characters in the movie have their explanations, both scientific and apocalyptic, but in the end it doesn't matter. They are a perfect monster: cunning, relentless, and immune to reason. To feel how truly scary the movie is, just take a walk outside after watching it. Unless it's the dead of winter, they are out there. They outnumber us. And all they need is a little push.